Document Summary: This document covers the optimization of static meshes to gain performance. This is fairly involved and somewhat technical. For advanced users. Document Changelog: Last updated by Tom Lin (DemiurgeStudios? ), for document summary. Original author was Albert Reed (DemiurgeStudios?). Before breaking into this section on detailed mesh optimization, be sure you've read through LevelOptimization. Optimizing a level will yield much more significant results. Build meshes with the ideas contained herein but make sure to perform level-wide optimizations first. Before beginning any significant optimization, always attempt to identify the performance problem before trying to speed things up. If you optimize the wrong thing, you might not get any improvement at all. The performance implications of modular level-design are a bit tricky as they vary from platform to platform. In general, there are two types of rendering that take place, Batched and Un-Batched. There are tradeoffs for each. Ask a programmer which you are using since it drastically affects what you should worry about for optimization. In general, folks developing for consoles are using un-batched rendering and batched rendering on the PC. There are two considerations when doing optimizations, performance and memory, we'll cover both where applicable. We've left out the sorted triangle numbers, because they were always zero. Triangles only need to be sorted if they are alpha'd. The following sections will outline various times, and memory amounts and describe how to plan your mesh construction to run as fast as possible. The best way to determine which of these factors you will need to optimize is to run tests. Take a scene you'd like to optimize and perform the recommended optimizations for each value, not worrying about appearance or final art. When you perform an optimization that provides the desired framerate boost, go ahead and finalize the work. In un-batched rendering, each material in each mesh is rendered separately. We'll call the set of triangles on a mesh that share a material a "Section". The tables above give the number of sections being rendered for each scene. Batched rendering basically means that the meshes in the level are combined in memory and rendered as larger blocks. In general, this method of rendering is faster because it produces less CPU overhead. Each "Batch" is a collection of "Sections". As a general rule, sections for batched-render will render faster than sections for un-batched rendering because all of the sections that use the same material are rendered together. If you're using batched rendering which uses considerably more memory, chances are you're not too concerned about how big your memory footprint is. We'll focus this discussion around raw performance. Batch Setup Time - The amount of time spent by the CPU preparing batches to be rendered. Section Setup Time - The amount of time spent by the CPU preparing sections for the GPU. For batched rendering, you will likely find that your slowdowns are caused by batch setup time or Section Drawing Time. Generally speaking, Section Setup Time doesn't consume tons of milliseconds. Batch setup time can be reduced by cutting down on the total number of batches currently being rendered. Because each material on the screen is separated into a different batch, optimizing this time basically amounts to cutting down on the total number of materials in a scene. Section setup time can be optimized by reducing the overall number of sections, and by making them easier to process. To review - a section in batched rendering is composed of those triangles that use a single material in a static mesh. For batched rendering, if the same material is used multiple times in the Materials list of the static mesh, all those uses are packed into a single section. 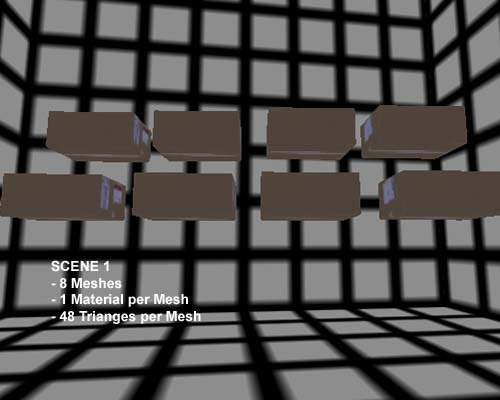 For example, in Scene 2, the boxes have 13 materials in the material list, but many of them use the same texture. There are only 5 unique textures used, and 8 meshes, for a total of 40 sections. It is worth noting that there is still some overhead for having duplicate materials in the materials list, so the practice should be avoided. The number of sections can be reduced by using fewer materials on a per-mesh basis. 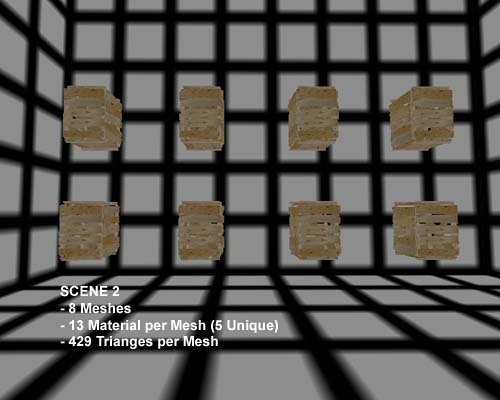 If the crates in Scene 2 used just one texture then they would only have 1 section each which would speed things up. The time it takes to draw a section is governed by the video card you're running on. Different video cards are good at rendering different kinds of materials under different circumstances. As a general rule on PCs, this value is probably governed by fillrate. You can see visually using the fillrate render mode in UnrealEd? and in-game. Mesh Setup Time - The amount of time it takes the CPU to prepare a mesh for rendering. Section Setup Time - The amount of time it takes the CPU to prepare a section for rendering. Section Drawing Time - The amount of time it takes the GPU to actually draw the section. Mesh Memory Footprint - The amount of memory taken up by a given StaticMesh. with un-batched rendering, repeated meshes only exist in memory once. Mesh setup time is not mostly constant for every mesh. For un-batched rendering keeping the number of meshes in view to a minimum is the the best way to keep cut down this time. Combining small meshes into larger meshes is one good way to go about this. Great examples of places to speed things up are by combing tiles described in WorkflowAndModularity document. Additionally, in outdoor scenes using Decolayers with tiny meshes will be subject to problems, use them sparingly. The same rules for optimizing mesh setup time apply to section setup time for meshes. Like mesh setup time, the best way to reduce the this cost is to cut down the number of sections. Unlike batched-rendering sections that use the same material on a given mesh are not combined into single sections, making redundant materials in a mesh especially bad in the un-batched rendering method. This is the same for batched and unbatched rendering. Take a look at the batched rendering description of this time. Un-batched rendering is great for cutting down memory, because the static mesh vertex data only need to exist once for each static mesh. That means, if you duplicate a mesh in a level, the information about its vertices only needs to remain once. Take ample advantage of the techniques discussed in WorkflowAndModularity and you'll save tons of memory in the process.